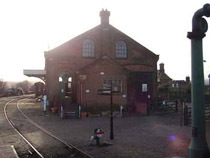 The band made their debut gig at this converted goods shed at the East Anglian Railway Museum. Spring / early summer 1989 - Damon, Graham, Alex and Dave's new band, christened Seymour (from the J.D. Salinger character, Seymour Glass in Salinger's Seymour: An Introduction), is formed, and do their first gig at the East Anglian Railway Museum, five miles outside Colchester, in front of various friends and high on such diverse influences as The Pixies, Kurt Weill, Dinosaur Jr and Antonin Artaud's "theatre of cruelty". (The first ever rehearsal of Seymour took place at The Beat Factory on 18th December 1988. 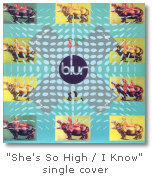 This session produced "She's So High"). November 1989 - The first journalist to take notice of them is Music Week / Sounds journalist Leo Finlay, who describes their performances as being "astonishingly tight and imaginative". In the very first review of them he writes, the band are credited as "Feymour" thanks to the article being dictated over the phone. Seymour send Food Records man Andy Ross a demo which contains "She's So High", "Dizzy", "Fried" and "Long Legged". He goes to see Seymour live at the Powerhaus in Islington, North London and is suitably impressed. December 1989 - Food Records approach Seymour, offering a record deal. All four members meet up with the two chiefs of Food Records, Andy Ross and David Balfe (formerly of Teardrop Explodes) at Soho Pizzeria. Over a deep pan they discuss the deal. There are two stipulations - before they can sign, Dave must stop wearing his pyjama bottoms at gigs, and they must change their name. After going through several possible names, such as "The Shining Path", "The Government", "Sensitize" and "Whirlpool", they agree on the name "Blur" - "a bit arty but not obscure," says Ross. Damon's management deal with Maryke Bergkamp and Graeme Holdaway of the Beat Factory falls through after he walks out on them, though they helped getting Seymour/Blur a deal. Relations between Damon and the Beat Factory had been getting "stressful". 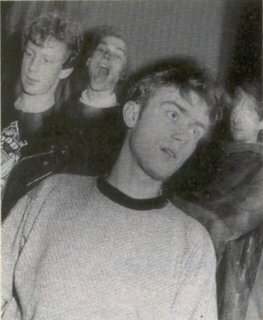 March 1990 - Blur officially sign with Food Records. Graham and Alex give up their degrees, and the new band begins a tour of the UK. The music press start taking notice, though it is not always complimentary - "He's obviously been eating too much cheap beef," says the Melody Maker, referring to Damon's antics. July 1990 - The tour ends in London, with gathering interest from music journalists. One of their biggest fans is another Sounds journalist, David Cavanagh, who describes their live performances as "breath-taking". The band begin recording tracks at Battery Studios, well known for being the place where The Stone Roses recorded Fool's Gold, with two songs being looked at as a possible first record - "She's So High" and "I Know" (both tracks produced by Steve Lovell and Steve Power). December 1990 - Blur return to the studio to record a follow up to "She's So High". However, sessions with Steve Power prove to be problematic, with the two songs they have chosen as possible seconds singles - "Close" and "Bad Day" - simply not working. Salvation arrives in the form of producer Stephen Street, who had previously worked with The Smiths. Street had seen the band's video for "She's So High" on the BBC television programme Juke Box Jury, and had wanted to work with them. January 1991 - The band record two songs with Street - "Come Together" and "There's No Other Way". The second had not been marked for greatness by the band, merely intended as a throwaway, but Street makes the song "baggier" and turns it into a proper indie dance song. Balfe and Ross are delighted by the results and the song is marked as the next single. 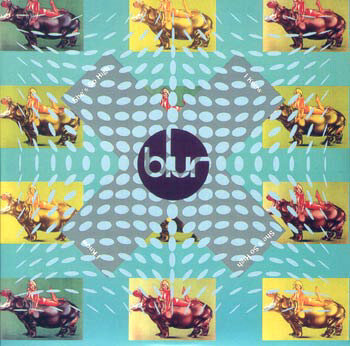 April 1991 - "There's No Other Way" is released and the music press fall head over heels for Blur. NME, Melody Maker, Sounds and Smash Hits go mad over the single, the video for the song which is a parody of the British OXO adverts gets screenings on the ITV Chart Show. Blur appear on Top of the Pops for the first time. The track gets a lot of radio airplay and it peaks at Number 8. 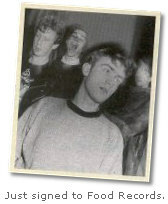 June 1991 - The group spend the early part of the summer basking in all the press attention. They are regularly seen at the indie club Syndrome, and start recording at Maison Rouge studios for their debut album. Damon starts going out with Justine Frischmann, then playing guitar in Suede. July 1991 - "Bang" is released as a preview of the album, and gets the NME Single Of The Week award. Blur make their second apperance on Top of the Pops. In this performance, Damon messes around with a cardboard chicken head. But "Bang" underperforms after the Top Ten success of their previous single - it only reaches 24. It's at this point that strain appears in the relationship between the band and Dave Balfe. Both parties have very different views on what kind of music they should be making. "The stumbling block was that he wanted us to be Jesus Jones", Alex would say later. August 1991 - The first album, Leisure, is released to mixed reviews. The Melody Maker gushes about "guitars like forests of burning pylons", but the NME are somewhat underwhelmed, claiming: "Blur are really pretty good. But it ain't the future. Blur are merely the present of rock and roll." It peaks at Number 7 in the Gallup chart and Number 2 in the MRIB chart. September 1991 - Blur are unhappy with their album, thinking that their B-sides have been better. They record some new material, which is a vast leap in quality from Leisure. Among the tracks are "Oily Water" and "Resigned". October to November 1991 - The band play a gig at Kilburn National Ballroom, and premiere their great new song, "Popscene". Shortly after that, they play it on an edition of the Channel 4 show The Word. The band do a debut tour of North America, starting in Toronto. At the Marquee club in New York they meet My Bloody Valentine's Kevin Shields, who delights them by declaring that he loves the Leisure song "Slow Down".